Well, what a month! Apologies for not posting much this month, but we seem to have not stopped work at all. The saying 'March winds and April showers bring forth May flowers' has not applied to 2006. More like 'May wind and May showers bring forth May flowers'! Still, we can cope with whatever the weather can throw at us, we are hardy gardeners... The last week has been spent mowing, tiding, sweeping, weeding, rushing, and changing wet gloves for a fresh pair each break, as we get ready for our open day on the 29th, Monday Bank Holiday. The plants are revelling in the lush conditions, and when the sun does come out, I am sure you can hear the leaves growing. 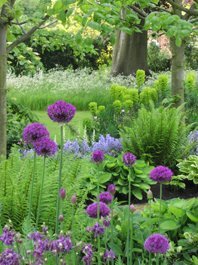 As you can see in the picture, the alliums and bluebells along the length of the Herbaceous Borders look stunning at the moment, the ferns and hostas are unfurling and euphorbia charachias subsp. wulfenii with its acid green flowers adds a lovely, sharp edge to the colour scheme. Put it in your diary, only 4 days left to go - and the weatherman promises no rain! Linette Applegate is Head Gardener at a 16th Century Manor house - Toddington Manor in Bedfordshire, England. She also owns and runs Applegate Gardens Ltd. providing bespoke garden design and landscaping in Beds, Bucks and Northants, alongside instant inspiration online with approx 200 ready-made garden design downloads and a unique garden design software solution for beginners, designers and landscapers through 'Garden Design Pro'. Keep up with news by Subscribing?